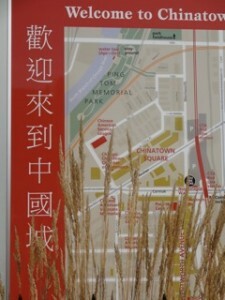 Kirigami at the Chinese American Service League; 20 Neighborhoods through Woman Made Gallery. 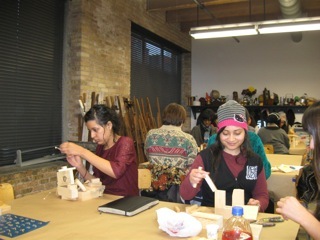 Wood sculpture making in the class, “Women Artists Who Rock!” at Marwen. I have taught metalsmithing, working with Precious Metal Clay, mixed media collage painting, simple printmaking, felting (wet felting from roving) and art history. The purpose of this page is to share the work I’ve done with community groups and some ideas for future projects. I’m very interested in doing more work teaching workshops in community settings, empowering people and helping them re-connect to their creativity. My art and teaching practice in the past few years has expanded to include what’s often called social justice work. For me, that has meant teaching at Marwen in Chicago, and in 20Neighborhoods (20N), a program of Woman Made Gallery in Chicago. Through 20N, I taught at CASL, the Chinese American Service League. In both cases, I was teaching underserved populations and what can I say? It was terrific. Bringing art-making to those who haven’t had the chance to do it is an honor. Being the one to create the environment of art making, setting it all up so that the magic can happen, is pretty cool. The gratitude these students have for their experience is what tells me how important this work is. What might that look like? Here are some projects I’ve worked on in the past. 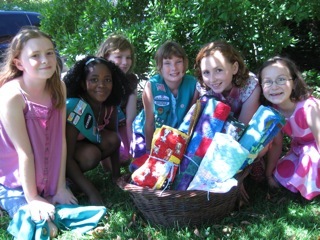 Girl Scouts deliver quilts to donate. 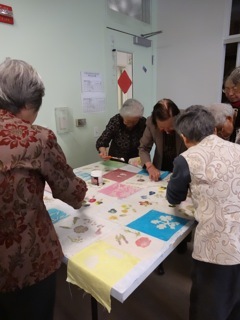 For this project (above), 8 girls made 7 quilt tops (later completed by adult volunteers, the quilting and binding steps) that they gave to resident children at Hephzibah House. You can read more about these on the Community Work Page. 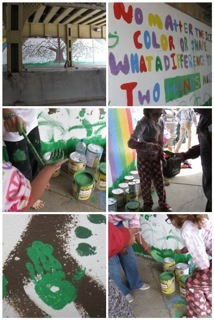 The mural is a design by a Girl Scout, executed with assistance from artist Linda DuPree. Blank Canvas of EXPLORE at the Forest Park Public Library. 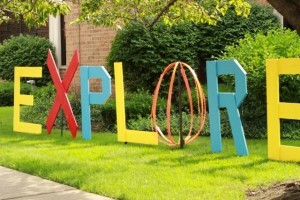 For this project I built the 4′ wooden letters that spell out the word explore, the summer reading program theme for the summer. Library patrons came to decorate the letters. Library patrons paint letters at Forest Park Library. Here’s a wonderful piece that could be done as a collaborative group project. 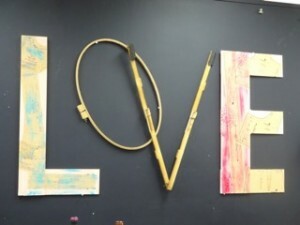 I made the capital E in this installation that was at Flourish Studios a few years ago. 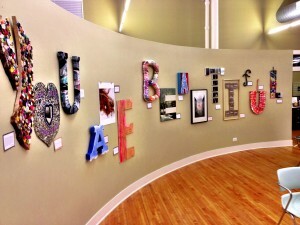 In this installation, a different artist made each letter. 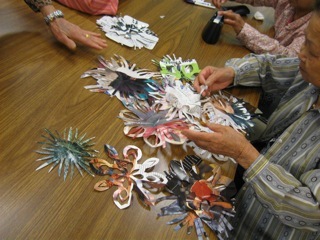 In a library program, different groups could work together to collage each letter. Each group could be given different materials and creative constraints. Tibetan prayer banners blow in the wind in the temples where they hang, spreading blessings. 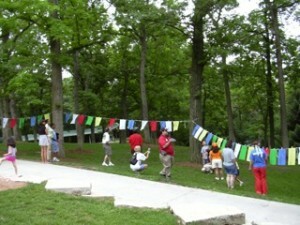 This picture shows a temporary outdoor installation on a theme. I can think of many themes to have groups make these on. The first that comes to mind is Blessings for our Community. 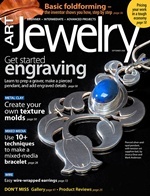 Images and descriptions for currently available workshops and multi-week courses are HERE.